A foreign land, rich in culture is seductive, ever so fresh and intoxicating. Yet at the same time, it can be suffocating and forbidden without the necessary language skills. As social animals, integration and interactivity are crucial. We want to be heard but when empowered with the tools to do so, dare we make the leap? Bruno Quinquet is such a tale. His “Salaryman” project is an amazing journey of lyric poetry in the making. An on-going saga of how the need to communicate challenges accepted norms. Invisible Ph t grapher Asia: Bruno, you were a recording engineer in France for two decades before moving to Japan to become a photographer. Why Japan/Asia? Why not remain in Europe? Bruno Quinquet: In 2001, I started to study the Japanese language in Paris. Then in 2005, I decided to come to Tokyo for a year long career break and study there. I had no particular interest in photography at the time. Things happened to be much more difficult and stressful than expected, though. I was studying with young Koreans and Chinese who could pick up the language very fast. After 6 months, I stopped attending school and bought a camera. I guess I was unconsciously looking for a way to escape my struggle with language. With photography, I could explore my new surroundings and express myself in a personal manner. From the day I realized that photography permitted creativity and authorship, I decided to invest myself into it. It was not “I am going to be a photographer” but “I want to tell a story with photography”. How has sound/music shaped your photography? In the 90’s- early 2000’s, I spent quite some time composing electronic or sample based music. The combination and sequencing of images in a narrative is such a similar process that photography appeared to me as a natural development. Some of my models in terms of creativity are music bands. For instance, the German band Kraftwerk produced a very original and consistent package of music, sound design, and visuals. This is the kind of creative freedom that I am aspiring to. What did you learn at the photography department of the Tokyo Visual Arts College? How did you overcome the language barrier? My level in Japanese was clearly not satisfying but just enough to enter the school. Then, the teaching was very hands-on, with little emphasis on theory, which was just perfect for me. When I wanted to know more about certain subjects, I searched the web. Students were encouraged to take a lot of photos to find their own style. My favorite time was spent in the darkroom. Introduction to photographers or other visual artists through books and videos was very interesting too. How else do you educate yourself about photography? Whose works do you follow? I try to think about photography with other visual arts or music in mind. The first photographers who opened my eyes on the medium were Lee Friedlander, Stephen Shore, Eikoh Hosoe, Daido Moriyama, Philip Lorca diCorcia… Lately, two of my favorite photographers are Viviane Sassen and Paul Graham. Bruno, how did the idea for a book on “The Salaryman Project” come about? How did it evolve? After 2 or 3 months shooting for this project, spring came and many places I had already been shooting took a new face. This is when I got the idea of a business calendar. As I was gathering more and more photos, I thought that an illustrated business schedule would be a better way to refer office work and the cycle of the seasons at the same time. I started to do some research about how season affects social life in Japan and new photographic ideas came to me. How did you find a designer and publishers to work with? I consider the design as an integral part of the work, so I do it myself. If I can learn about photography, why not learn about design too? I met several publishers, received good advice but nobody was willing to take the risk. I decided to self publish, with the help of a crowdfunding campaign that I am preparing. How long did this process take, how many drafts, how much editing? What advice would you give to someone wanting to publish? I am not in a position to give any advice, except “go ahead!” Everybody seems to agree that now is a great time for self publication. Why the subject, salaryman? And why conceal their identities? In October 2006, I went on a daily excursion near mount Fuji. Suddenly, a fast paced salaryman with suitcase appeared on the trail. I was stopped in my tracks. I took a photo. He was gone. The photo was bad but this initial vision wouldn’t leave me: the Mount Fuji, the forest and the salaryman… The next day, I knew that I had found a story and started my project. I joined flickr and uploaded my very first photos, but very soon, I felt uncomfortable at posting pictures of strangers on the net. I guess that this feeling came from growing up in France, were portraits rights have turned the candid photographer in a suspicious figure. What’s more, I am camera shy myself. At first, concealing the identities was a way to feel at peace with these issues. But then I realized that it was also a perfect way to give a sense of mystery and poetry to a supposedly boring subject. As a person who never worked in an office, I like to think that the apparent normality of the salaryman hides a fantasy world to which I have no access. How long did you spend on the project? What difficulties, if any, did you encounter in photographing the salaryman? Did being a foreigner help? Taking photos of salarymen is easy: they are busy, tired, and many! What is difficult is to be able to consciously enjoy the act of seeing, be focused and relaxed at the same time. Being a foreigner might have helped, but I think it’s easy to take pictures in public in Japan. Bruno, do you consider yourself a street photographer? I am not trying to be a street photographer but I consider that this specific project is street photography. It’s candid and urban. How much of a role does luck play in street photography? There is an element of chance in individual photographs, but you can’t develop a project by chance. To be lucky is to be alert and dedicated. It’s hard to be lucky. What makes a good photograph? And good photographer for that matter? I don’t know. It’s the same with a painting, a poem or music. There is always something that resists explanation. Maybe that a good artist is someone who struggles with form, whatever the medium. What other projects are you working on? Any possibility of a complementary Office Lady series? 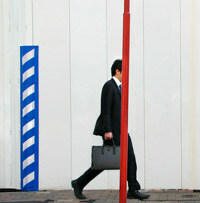 The salaryman project is about masculinity and normality in Japan, and about how I relate to that as a man in his 40’s. It’s a bit like a self portrait in which I constantly reconsider how distant or how close I am to that norm. For this reason, there will be no Office Lady series… What’s more, it would be very tough! I am working on other projects but I am very slow. I just launched a crowdfunding campaign to support the publication of the “Salaryman Project”. A nice and unpretentious street project that results in good imagery.